Phylogenetic analysis plays a central role in modern life sciences, being routinely used to reconstruct the relationships among organisms and their evolutionary timescale. Phylogenetic methods are now widely used in evolutionary biology, epidemiology, palaeontology, molecular ecology, and linguistics. The broad applications of these techniques has meant that a diverse range of researchers have been involved in the development of phylogenetic methods. BEAST2 brings together these developments in a powerful and intuitive software platform. 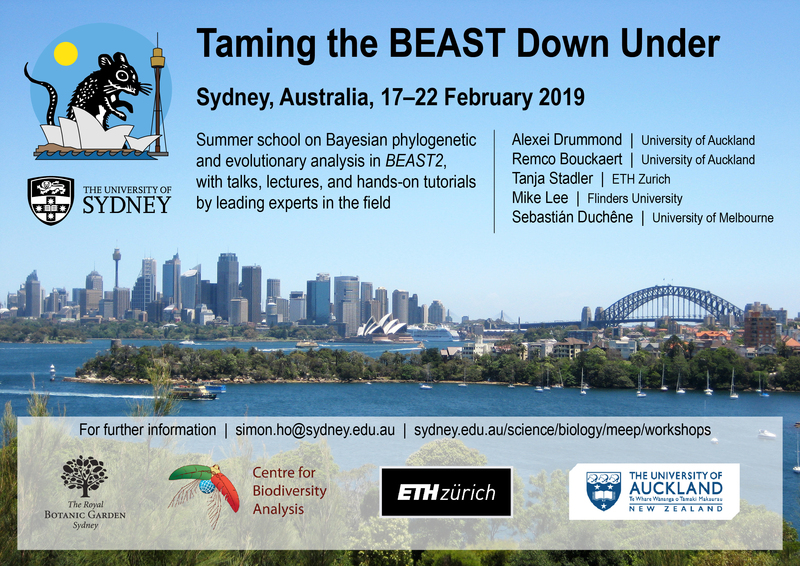 Taming the BEAST Down Under will be a one-week workshop, organized by the Molecular Ecology, Evolution, and Phylogenetics group at the University of Sydney. The workshop consists of invited talks, lectures, and hands-on tutorial sessions given by core BEAST2 developers and experts in phylogenetics. The aim of the summer school is to provide participants with a firm grasp of the theory behind the methods central to phylogenetics, as implemented in BEAST2. It follows the successful Taming the BEAST workshops that have been hosted in Switzerland, New Zealand, and the UK. Taming the BEAST Down Under will be held in Sydney from Sunday 17 February to Friday 22 February 2019. The CBA is pleased to be sponsoring the fee-waiver scholarships. A flyer for the workshop is available here. Topics that will be covered at Taming the BEAST Down Under will include: Bayesian phylogenetics, molecular clocks, total-evidence dating, phylogenetic model selection, species trees and gene trees, phylodynamic analysis, phylogeography, and trait evolution. By the end of the summer school, participants will be equipped with the skills necessary to perform analyses confidently and independently. Participants are also highly encouraged to bring along their own data sets and to engage with the teaching team to address any problems that they might be experiencing with their analyses. The summer school is geared towards postgraduate students and early-career researchers in the life sciences. Preference will be given to applicants who are not from a computational background and applicants who have already collected/assembled a data set that they are working on. Applications: Applications for the workshop are open until 31 October 2018. Up to 40 places will be available. To apply, please send a CV and a brief description of your research interests and explanation of why you would like to attend the workshop (approx. 100 words) to Simon Ho. We will notify successful applicants in the first week of November. Registration fee: AU$380. Lunches, morning teas, afternoon teas, and several dinners will be provided. Payment details will provided in the first week of November. Scholarships: We will offer several fee waivers for workshop attendees (sponsored by the CBA). If you would like to be considered for a fee waiver, please indicate this in your application. These fee waivers are primarily intended for those in need of financial assistance and/or those travelling internationally. Accommodation: Participants are asked to arrange their own accommodation. We will provide a list of recommendations for hotels and other accommodation.